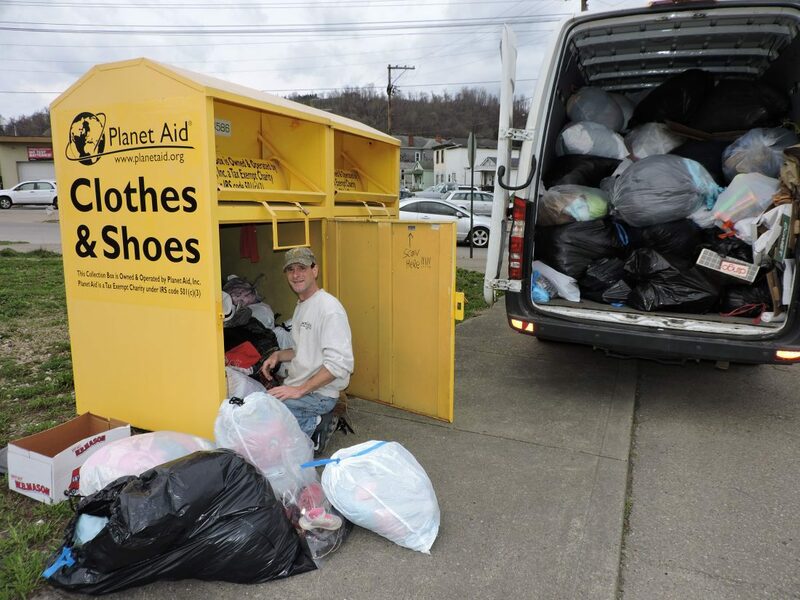 T-L Photo/SHELLEY HANSON PLANET AID driver Carl Nesbitt collects clothing and shoes from the donation box in Martins Ferry this week. 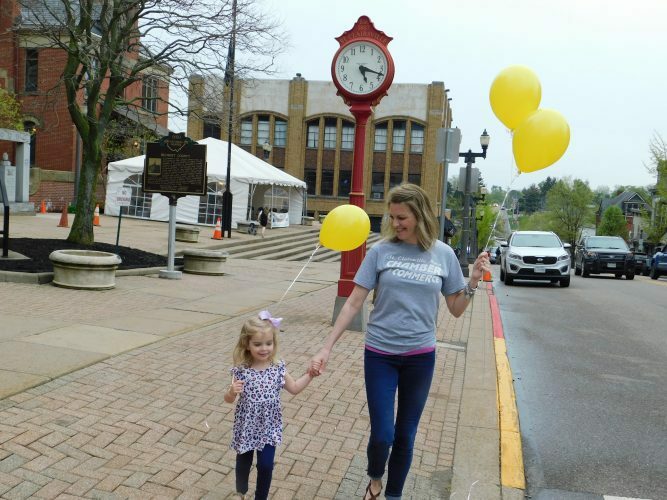 MARTINS FERRY — Passersby may have noticed two large yellow boxes at the corner of Jefferson and Broadway streets in Martins Ferry. They belong to Planet Aid, a company that uses the clothing to supply thrift stores in the United States and to sell overseas where there is a high demand for clothing, according to the company’s website, www.planetaid.org. This week Carl Nesbitt, a driver and collector for Planet Aid, was busy sorting through the many bags of donations at the Martins Ferry bins. Nesbitt said his Planet Aid headquarters is based in Irwin, Pa., and Martins Ferry is on one of two collection routes. He visits Martins Ferry twice a week to empty the bins. Lately with the warm weather, the bins have been full when he stops. According to Planet Aid, there is a high demand for secondhand clothing across the globe. “More than 60 percent of all donated clothes received by U.S. charities are exported to overseas markets … Most of this clothing (about 45 percent) is resold as is and worn again,” Planet Aid states. The remainder is often made into cloths for cleaning, recycled into a raw material fiber or into insulation or paper products. Nesbitt said once he collects from his route, the items are taken back to a warehouse in Pennsylvania. Then it is shipped to another location where it is bundled. Planet Aid notes the clothes are “pressed into 1,000 pound bundles” after being sorted. “Bales are typically shipped in sea-going, 40-foot containers. Upon reaching a destination port in Africa, Asia, Europe, India, China, South or Central America, bales are routed to overland locations by truck or rail car. Along the way numerous transactions may occur,” according to Planet Aid. “Bales may be divided into smaller bundles for sale to wholesalers or distributors down the line. Ultimately, an aspiring entrepreneur in a Mozambique village may buy a 100-lb sack for resale to his friends and neighbors. The yellow bins used for collections are water tight and locked. Donating clothing to the bins or local thirft stores helps keep the items out of landfills. Some may wonder why Planet Aid does not just giveaway the clothing to countries overseas. 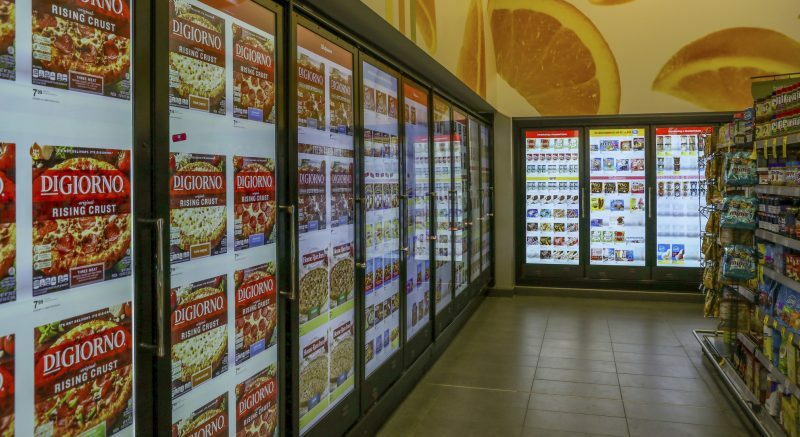 According to the company, doing so can actually cause more harm than good. “Donating the clothes to developing countries would actually be detrimental to the local economies. Simply giving things away only puts a band-aid on the larger problem of poverty, and if clothing is free than the livelihoods of local retailers, tailors, and others in the textile industry are put in jeopardy,” Planet Aid states.